This Wednesday, I'm not really wondering about anything at all. Actually, that's not true. I'm intensely wondering (i.e. worrying) about a number of things on my Olympic Sweater. But those wonderings aren't ready for prime time -- no pictures, for example -- and since the Olympic Sweater is all I'm working on these days, I don't have any other questions burning a hole in my blog. have been watching something really gripping on TV when I did that one. They're speckled! I love the colors of these socks so much that I found a way to wear them to the office last week with dress pants. Everytime I got glum about the dreary winter day, I just looked at my socks. Instant mood improvement! Yay! I love them, too! 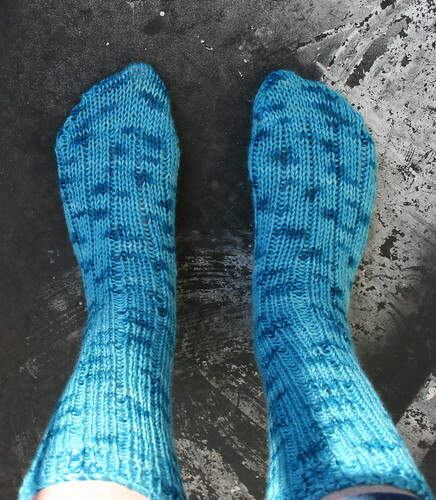 Oooh, I keep thinking of the Supermerino for socks, but 3s and thinking of going down to 2s! I was planning on 5s. Eh, add them to the sock queue! I just made a scarf with this yarn and in the same color, too! The color is great, so bright. I made the scarf for the International Secret Scarf Exchange.